Green smoothies are one of my favorite ways to lose weight quickly. I have been drinking them almost every day for over 4 years and still like to use them when I’m feeling bloated or feel a cold/flu coming on. Find the best green smoothie recipes you can easily prepair every day. Also called detox smoothies, fruit smoothies or vegetable smoothies, these easy green smoothie recipes make a deliciously easy way to get all your nutrients… through a straw! The American Cancer Society recommends that we eat 5-9 servings of fruits and vegetables each day to prevent cancer and other diseases, and these recipes are a great way to get those servings (1). Even kids love green smoothies! My daughter loves the Crazy for Kale Smoothie (recipe below) and of course, has to have her own jar. Start with veggies you can’t taste! Add creaminess with almond milk! Stock your freezer with organic frozen fruit and vegetables. A green smoothie recipe is a blended drink that mainly contains vegetable greens or fruit, or a combination of both. They are an easy way to flush your body of toxins, get lots of healthy nutrients, and lose weight fast. 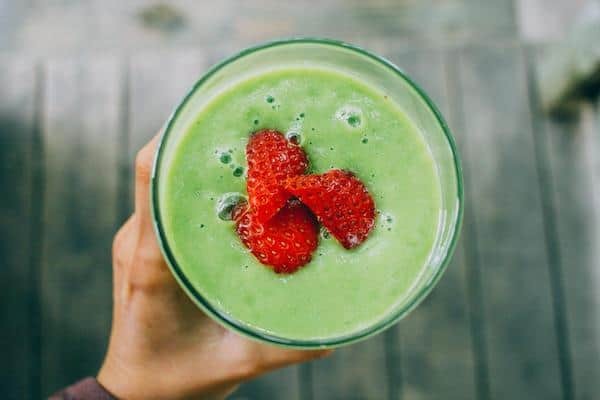 Green smoothies are often green or bright green and may not exactly look like the most delicious meal, but if you do it right you’ll not only love these simple green smoothies, you’ll crave them! Your hunger will not only be satisfied, but you’ll also feel great and lose weight as well. Key Point: A green smoothie is a blended mixture of fruits, vegetables, and other ingredients. The green vegetables give it its distinctive color. Because green smoothies contain all the edible parts of the plant, not just the juice, they are healthier than fruit or vegetable juices. When juices are extracted from fruit or vegetables, the fiber portion of the plant is removed. Green smoothies also contain a large amount of water, which helps boost your metabolism (2). When you eat fruits and vegetables in the raw state you get double the nutrients, because when you cook food it loses half of the vitamins and nutrients. Green smoothies are easy to make. You don’t need any special equipment, just a regular kitchen blender. You can purchase a Vitamix blender if you’re really serious about making green smoothies every day. 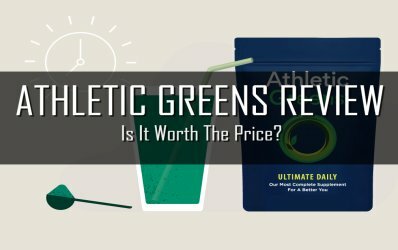 Green smoothies are also cheap (if you make them at home). While a vegetable smoothie at a juice bar may set you back up to $7, a homemade green smoothie may only cost you $2 – $3 on average. Shop at your local farmer’s market and save even more money while getting the freshest fruit and vegetables possible. If you’re not a fan of drinking something “green”, try starting out with baby spinach in all your green smoothies. A spinach smoothie recipe has a very mild flavor and will naturally add vitamins and boost your metabolism. You won’t even know it’s in your smoothie, all you will taste is the fruit. Over time, try swapping half of the spinach for kale or chard. Key Point: Green smoothies provide vegetables and fruits in their rawest form, so you get all the benefits and nutrients of the whole plant, including lots of fiber. Green smoothie recipes are really easy to make. To make a green smoothie, all you need is a blender, and not even an expensive one, I’ve been using my $20 blender for a number of years and try as I might I haven’t broken it yet! Special Tip: If you’re serious about green smoothies, I recommend you check out our list of best smoothie blenders. A good smoothie blender encourages you to drink more green smoothies, and the health benefits are worth splurging for. Here are some of the best green smoothie recipes I have found. I encourage you to try different ingredients and find the ones you especially like because the goal is to drink these green smoothies as often as you can. This is a twist on a classic green smoothie recipe. It’s a spinach smoothie recipe which blends perfectly with the delicious flavors of strawberry and oranges (always a yummy combination). Smoothies with spinach are some of my favorite green smoothie recipes. The metabolism boosting secret is the almond milk, which contains extra protein and creaminess. Studies have shown that protein increases the thermic effect of food (TEF) due to the extra calories required to digest it. This causes a rise in your metabolic rate. This is one of my favorite recipes for a detox smoothie flush. Not only does it taste really delicious, but it also helps boost your metabolism, too! Broccoli is an extremely healthy vegetable, often referred to as a “super veggie”. It’s high in many nutrients, including vitamin C, vitamin K, fiber, potassium, and iron. Broccoli also contains more protein than most other vegetables, which gives you an extra metabolic boost (4). This Purple Passion Green Smoothie recipe is a spinach smoothie recipe that’s full of antioxidants thanks to the strawberries and blueberries. The flavors all blend perfectly into a really delicious, mellow, creamy weight loss smoothie that’s also got a fun purple color. Strawberries are packed full of vitamin C, naturally increasing metabolism. 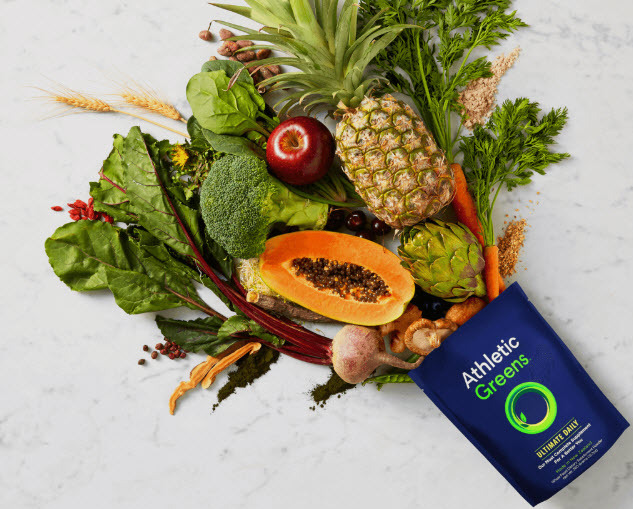 They are also a natural anti-inflammatory, making them perfect for enjoying after a workout, reducing muscle soreness, opening up breathing passages and reducing bloat (5). This is another really good recipe if you’re just starting out with green smoothies. The flavor is divine, and you can hardly taste any of the spinach since smoothie with spinach tends to be milder tasting. You mostly just taste the banana and strawberry flavors with a hint of vanilla. Fruit smoothies recipes generally taste mostly like fruit, and this is one of the best green smoothie recipes I know. Bananas are extremely healthy and delicious. They provide several essential nutrients and have benefits for digestion, heart health, and weight loss. This is a really healthy vegetable smoothie recipe that has a very unique taste thanks to the apple pie spices and vanilla. It’s one of my favorites to make in the Fall to remind me of apple pie. Apples are high in fiber, vitamin C and various antioxidants. They are also very filling, with a relatively low-calorie content. Studies show that eating apples can have a lot of health benefits (7,8,9). This is a delicious green smoothie recipe that has a really bright green color. It’s full of vitamin C thanks to the double dose of pineapple and oranges. Pineapples are a good source of many nutrients, such as vitamin C, manganese, copper, and folate. Pineapples also contain a plant compound called bromelain, which is associated with many health benefits, such as improved immunity, fighting cancer, faster wound healing and better gut health (10). This Sweetie Pie Green Smoothie is one of my favorite green smoothies recipes when I want to change up my greens. It tastes amazing and is full of antioxidants and other nutrients. Peas are very good for you. Due to their high fiber and protein content, they are very filling. This may reduce how much food you eat and can lead to weight loss in the long term. This is really tasty fruit smoothie that’s got a light creamy texture and great flavor. It contains lots of antioxidants and other beneficial nutrients. Mangoes contain soluble fiber and a wide range of antioxidants, as well as high amounts of vitamin A (from beta-carotene) and vitamin C (12). This is another fantastic recipe that is full of antioxidants and vitamins. It has a slightly sweet flavor, with a little tanginess from the pineapple and orange. Carrots have a number of health benefits. They are a good source of beta-carotene, fiber, vitamin K, potassium, antioxidants and have been linked to lower cholesterol levels and improved eye health. This is my #1 favorite green smoothie recipe for my family. Not only it is delicious and kids FRIENDLY, but it’s full of antioxidants thanks to the cherries and blueberries. Kale is one of the healthiest and most nutritious plant foods in existence. It has a low-calorie content, it’s an excellent source of vitamin C, and even helps fight cancer. I recommend you use fresh ingredients for this green smoothie recipe, but you can also use frozen fruits and vegetables if fresh isn’t available. Just be sure to get organic both in frozen and fresh produce for your fruit smoothie recipes. If you’re cleansing your body, you don’t want to be adding in pesticides while you do it! Get creative with ingredients in your green smoothies, try a 2 to 1 ratio (2 vegetables to 1 fruit) to ensure super yummy green smoothies. If you make a goal to replace all your meals with green smoothies, you may get sick of it and give up. Instead make a goal to replace 3 meals a week with a fruit and vegetable smoothie, after a month of doing this you will start craving them and will find yourself wanting one day if not more! Spinach is my favorite as it has no flavor when blended with yummy fruits, cucumber also has a mild flavor and is a good vegetable to start with and carrots are almost as sweet as fruit and make great juices. Follow the 2 to 1 equation. Two fruits and one vegetable, this will keep your smoothie sweet and delicious instead of tasting like a blended salad. Add almond milk to thin your fruit smoothie recipes, not juice! Juice will only add calories and chances are it was pasteurized which means it was heated up and therefore lacking in nutrition. Almond milk is a great way to add protein and best of all it naturally boosts your metabolism! When companies freeze produces they flash freeze immediately after picking, so you get the most flavor and loads of nutrition too. Plus it’s always available and makes for a chilly iced smoothie. You can also cut and freeze your own fresh fruits and veggies and store them in bags to make your fruit smoothie recipe, Tupperware or jars for quick ready-made smoothies. Mason jars work great for green smoothies! I love using large mason jars for these smoothies, they clean up nice and hold 3 cups of delicious smoothie goodness. Don’t wait until after you’re done with your smoothie. If you let it set it will be a nightmare to clean, but if you wash immediately it’s a breeze.